After passing by Len Duckworth’s Fish & Chips a couple times while exploring the Danforth, I’ve been meaning to make a visit for more than a year now, but never got around to it until recently. There are many great reviews of this place online, some even going as far as proclaiming it the best fish and chips in Toronto. I wouldn’t go quite that far. The fish and chips I had were very traditional and prepared well – the batter was light and crispy and not at all greasy, and the halibut was fresh, moist and a decent-sized portion. The fries (or chips) tasted a little odd to me though – not as in "they’re starting to go bad" odd, but they just weren’t the star of the show – very below-average. When all you have on the plate is just two things, you’d expect a little more effort to be put into the chips, no? The best fish and chips in Toronto? Probably not. The food was tasty enough that I’ll be back though. In terms of the service, it was attentive and polite but nothing extraordinary. From a small shop like this, (especially at a time when it wasn’t very busy), I would have liked to have seen a lot more personality, something memorable and not such a transactional approach. The service didn’t leave me feeling like "I can’t wait to come back here and bring my friends" it was more like the feeling of "yeah, sure, I guess I might come back again… Maybe." 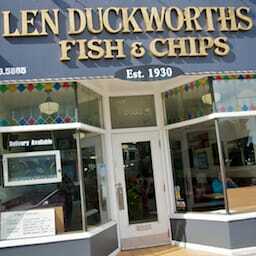 Len Duckworth’s Fish & Chips is not the kind of place I would venture across town for. But if you’re in the area, it’s worth stopping by and it’s probably one of the better places to grab a quick lunch in the area. Len Duckworth’s Fish & Chips was published on Monday, September 19, 2011 at 10:30am EDT by Daniel Menjívar and last updated on April 11, 2018 at 9:30pm UTC .